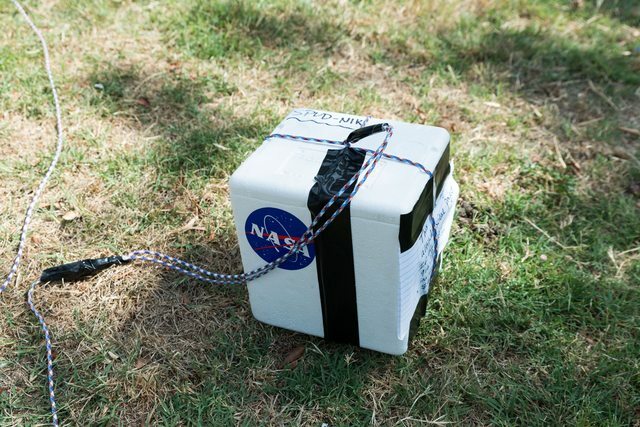 It began with a dream: launch a potato and some other equipment to over 100,000 feet, taking pictures with onboard electronics charged by potatoes. 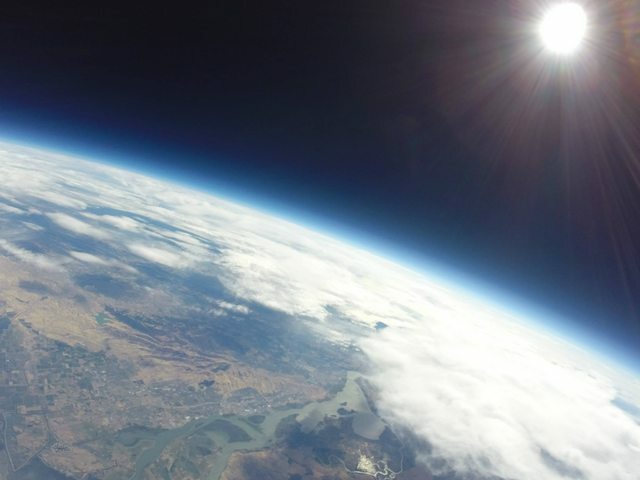 A year later, 42 Kickstarter backers made history with the first potato-powered balloon over 100,000 feet. 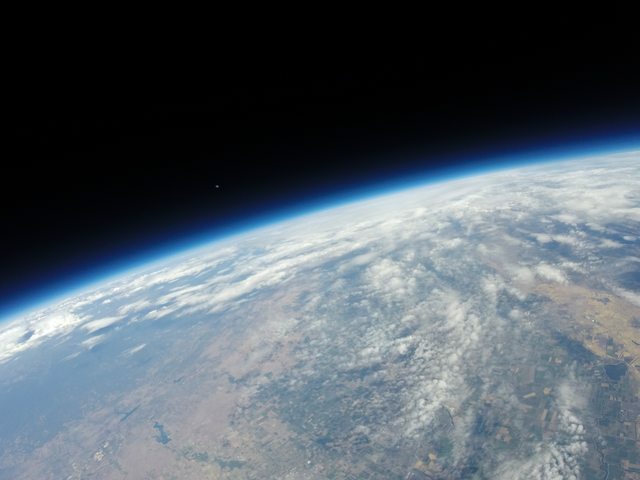 "Making history" is a bit over the top, but we did do something really fun and sciency: charged some electronics with potatoes and then flew them to the stratosphere while taking pictures. We're really thankful to the backers who supported this ridiculous experiment. I'm writing this post mostly for the benefit of our backers, but also as a postmortem and a fun recap of everything we went through. On Friday evening, the weather models showed a good flight was possible on Saturday or Sunday, so we gathered in our workshop to assemble everything. 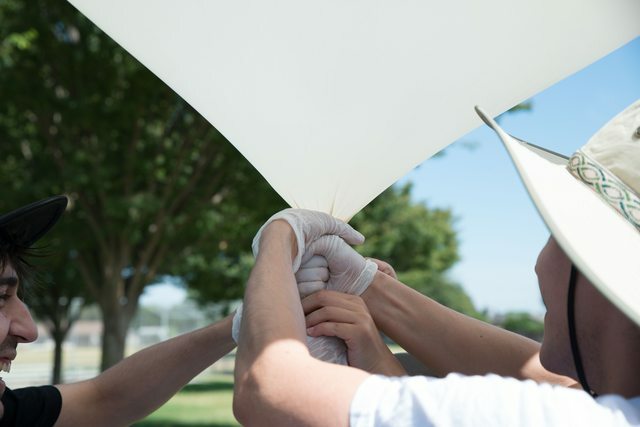 Putting together a lightweight weather balloon capsule is relatively straightforward. The only challenge with the extra potato mass was keeping it under 4 lbs, so it was technically unregulated. The first step was to create the structure. 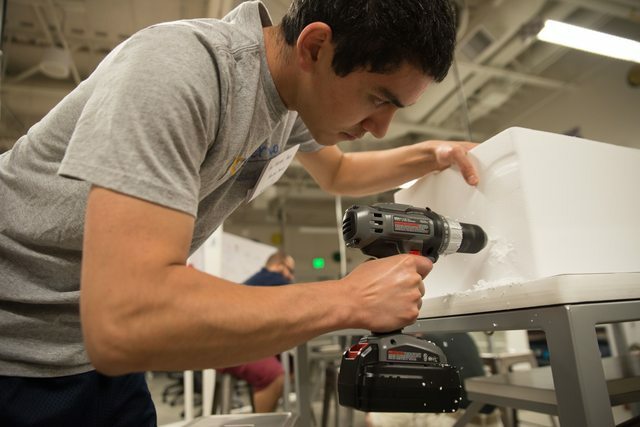 We had a bunch of different sized styrofoam coolers, so we drilled some practice holes and tried different techniques. Because GoPros are pretty flat in the front, we wound up having to shave the walls thinner with an X-acto knife. Aside from that, there was mostly just a lot of rope and tape. Securing the cameras, phone, gps tracker, and other electronics was a task that had to wait til we were onsite with everything powered on. In the workshop, we made sure that everything more or less fit, and weighed everything so we could get a better sense of what to expect (and more accurate models). Now for the "meat and potatoes" of the project...we were entering new territory here, so we started just by making a bunch of simple potato batteries. This felt like a cooking show. One of our team members worked on batteries for a spacecraft in low-Earth orbit. So he was in charge here. Even so, there were a lot of unknowns. We determined that the ideal potato potato battery is quite long, so we cut the potatoes lengthwise and cut sheets of metal to fit. Personally, I also learned that potato batteries are really more about the metal that you use rather than the potatoes themselves. Cutting potato battery sheet metal with a dremel. With this technique, we actually used surprisingly few potatoes. By cutting them lengthwise and separating each sheet of potato with a sheet of metal, we maximized potato efficiency. We eventually created Frankenpotato, an electronics-charging monstrosity that produced enough current to charge some batteries. 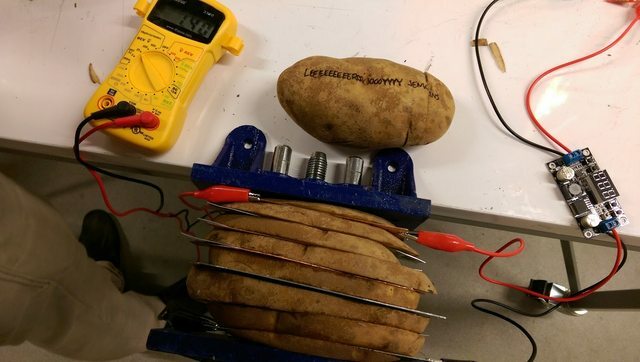 A Frankenpotato battery, and the backer-named "Leeroy Jenkins" potato. We discovered, perhaps not surprisingly, that it was unrealistic to charge all the electronics (GPS tracker, 2 GoPros, cell phone, cell phone backup battery) in a single night. The amount of power produced by potatoes is quite low. 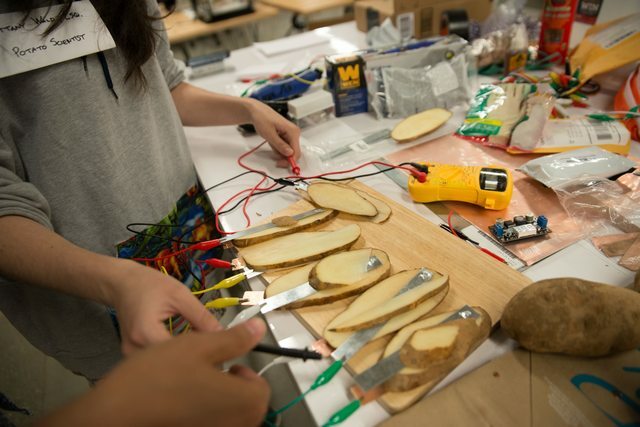 Nevertheless we were able to charge nontrivial amounts of electronics using potatoes. The night wasn't over. 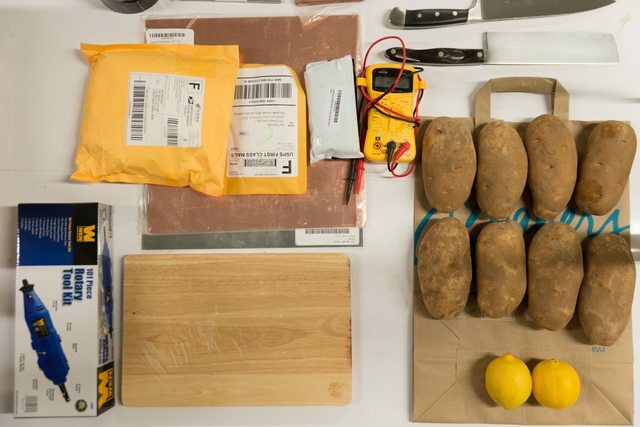 One of the Kickstarter rewards was "potato whisperer," which promised to use a computer program to speak the names of backers to the potato on the eve of the flight. The goal here was to inundate the potato with good vibes. One thing that I didn't plan for during the Kickstarter is that I now have a housemate. 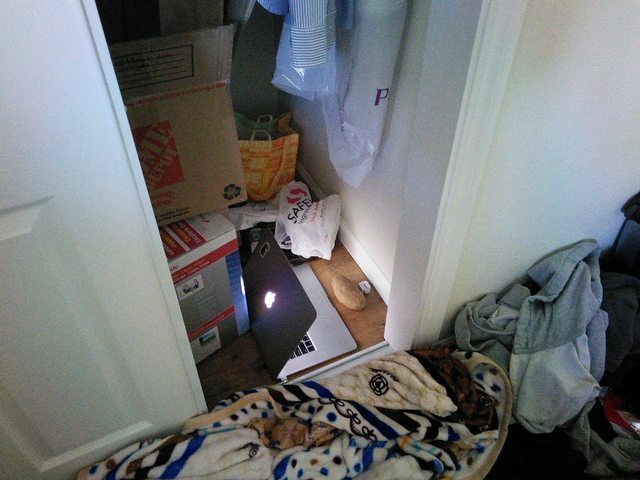 So to avoid disturbing the household, I had to keep the potato whisperer in my room overnight. It was a tough night. The names of our backers are branded in my memory forever, on repeat. Here's a short preview (now imagine falling asleep as this played for 12+ hours). This part was pretty simple. 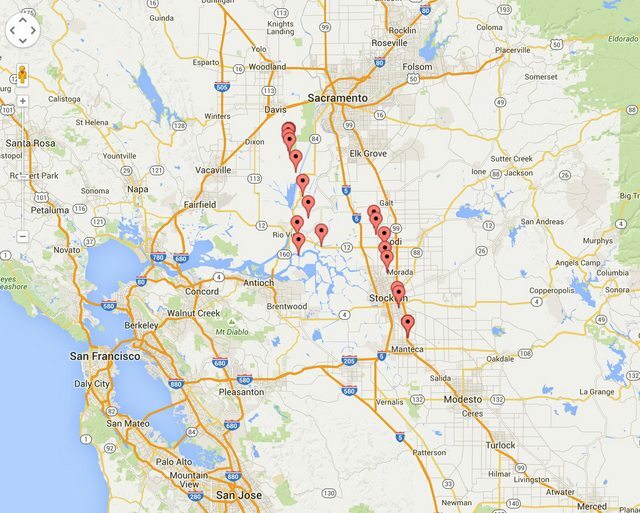 We knew we wanted to launch in California's Central Valley because it's a huge open area with high chance of recovery. 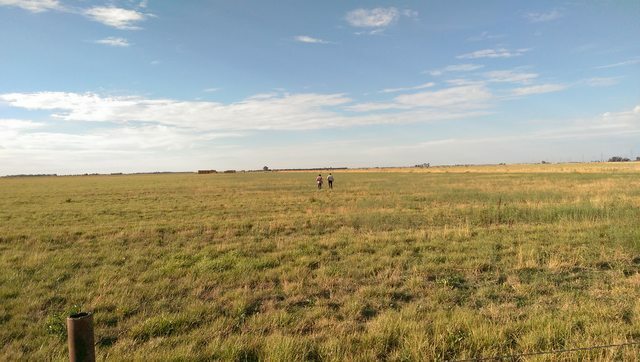 We learned from past balloon launches to remain pretty flexible in terms of our launch site. We knew we were launching in the Central Valley, but even as we were driving out there we didn't know where we'd do it. 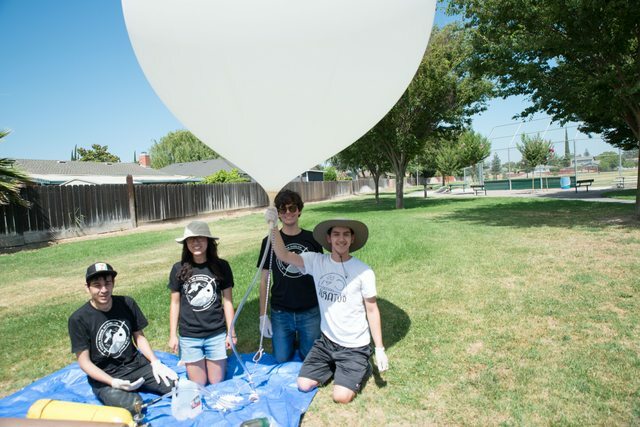 Once we picked up our helium from a party store and our ETA became clear, we ran a bunch of flight path simulations with varying weights and amounts of helium from different parks between Stockton and Modesto. We wound up choosing Raymus Village Park in Manteca, with a predicted landing west of Sacramento. It took about an hour to put everything together at the park. This involved slowly inflating the balloon, starting all the electronics and verifying they were working, and connecting all the various components. On a whim (and after some debate), we decided to add a second GoPro. This means we had to do some payload surgery on the spot (scraping out another hole for the GoPro). This proved to be a fortunate decision because it turned out one of the GoPros overheated before it even left the ground, which is why we have 5,000 still pictures but no video. No real regrets here as the video would have been pretty nauseating, with the camera swinging around wildly. Critical moment: tying off the balloon. We spent too much time getting everything set up. A formal checklist would've made things smoother and easier. 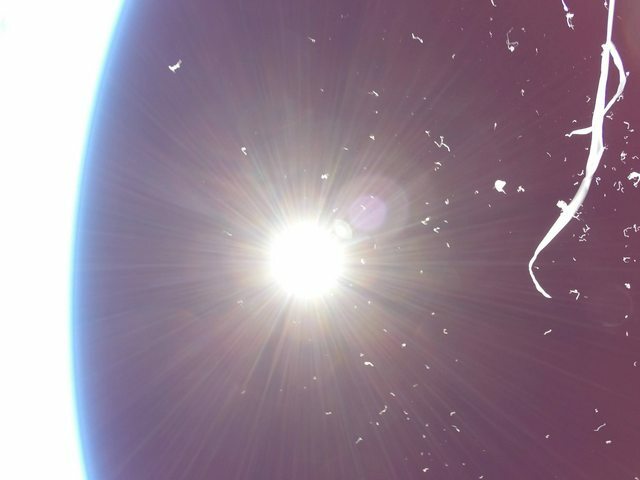 The GoPro likely overheated because it was really hot out and the payload was packed with chemical hand warmers. In our effort to keep the payload from getting too cold in the upper atmosphere, we overheated our electronics on the ground. All things considered though, it went quite well. In the past we've had problems with helium leaks, ripped balloons, and so on. In general, we knew what we were doing here and the park was a great place to set up (not pictured: convenient shaded picnic tables). Balloon setup area with helium tanks. 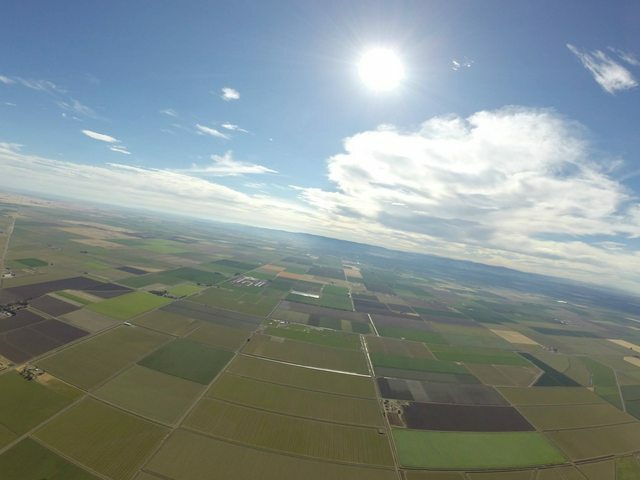 We launched near Manteca, CA and flew about 55 miles (88km) to the appropriately-named Yolo Bypass Wildlife Area, reaching over 100,000 feet along the way. We had a SPOT GPS tracker and a flip phone tracker on board, so we had a good sense of where things were during the flight. However, there were dark periods that were extremely nerve-wracking: phones, which reports GPS via 3G, stop working at roughly 5-10k feet, and GPS trackers typically stop working at roughly 20k. I think we got particularly lucky, as our tracking data is fairly complete. There is a hardcoded 60k ft ceiling to GPS as specified by US law, so that explains the gap in the mapping below of flight waypoints. The balloon flight path data, headed northwest. Note the general similarity to prediction above. The potato itself was recovered on a farm by a field of cows. It required a bunch of searching, but we were lucky that it was close to an aqueduct. We attempted to contact the landowner, but as no one was home and it seemed fairly close to the road, we recovered it by walking along and eventually jumping a barbed wire fence. 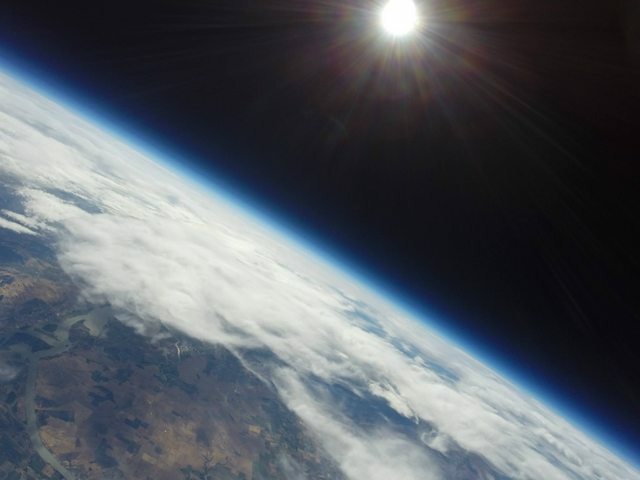 Although the pictures are pretty similar to those from other high altitude balloons, they are nothing short of spectacular. Who knew a potato-charged balloon could take pictures this nice? Thank you from the entire space potato team for making this possible!! And big thanks to my friends who were an essential part of the project. Potato batteries are pretty cool. Kickstarters are work. Money raised is misleading due to fulfillment costs. Physical rewards take a huge amount of time. Helium is expensive. We knew this going in, but it's jarring each time how your helium costs can be as much as everything else combined (although it's pretty cheap for a non-renewable resource, helium prices have nearly tripled in the last 10 years). Working with party stores can be confusing at times because they sell things in units of normally-sized balloons. The fate of the leftover potatoes. If you liked this post, follow me on Twitter for more fun projects! All content copyright Ian Webster © 2015 • All rights reserved.